This past weekend I ventured down to the Kennedy Space Center to catch the annual airshow on the grounds of the space center complex. While there I took the time to catch the 3D IMAX film “Magnificent Desolation”. When I had first seen this movie several years ago needless to say I was stunned at the visual impact and the realism. After following the space program my entire life and after having seen every piece of footage about the program, including every film, photograph, documentary, and reenactment through movies like “Apollo 13”, series like HBO’s “From the Earth to the Moon” and countless others none could do justice to the computer simulation of landing and walking on the Moon portrayed in “Magnificent Desolation”. Though the landing and walking simulations are just a small part of the story told in “Desolation” they nonetheless provide a visual perspective we’ve not seen before and short of being there none of us will ever get the chance to see. I actually felt like I knew was it was like to walk there and be there. It gave me a perspective the “real” footage could never provide and therein lay a dilemma for the future of the space program. The first space race tested our technology prowess on many fronts as we traversed a quarter of a million miles through the vacuum of space to land humans on another planetary body and we did that in a vehicle comprised of thin aluminum sheets built in two stages with two engines being driven onboard by a computer that had less power than a desktop calculator and barely enough space for two standing astronauts. Back then seeing to believe wasn’t necessary as we lacked the proliferation of technology in our everyday lives to impress us more than the reality could. Life was simpler back then and it was an era where we dreamed to take small steps and managed to make giant leaps. Feats like landing a man on the moon seemed so much more impressive to us back then because we lived in a world that overall was so technically unimpressive. Throughout the early space race most Americans still had black and white televisions, there wasn’t cable or satellite television (there were barely satellites), no around the clock news channels (most TV stations ended the day at 1am with the playing of the National Anthem), no NASA channel, no internet, no video games, no computer generated graphics, no PCs, no insight into other countries space programs via an endless stream of documentaries and books and online archives. The world was a vastly different place back then. Technologically, we were still growing up and the promise of technology, not the fear inspired us to use it achieve great things. When we look back it is amazing to see how far we went when the words of a single man challenged us to be daring and bold. That “challenge” to land a man on the moon and return him safely to the Earth came just after we had sent another lone man on a single suborbital flight into space that lasted just a few minutes. We have lost to time how impressive a feat that was in much the same way the heroism and scale of World War II has faded from our memories only to be replaced by less than accurate films that romanticize rather than provide the “guts and glory” feel of what it was really like to be there. During the space race our view of space travel was cemented in the classic movies of the fifties. The space related movies and TV shows of the era were often campy and unrealistic. Movies like “Destination: Moon” and television shows like “Lost in Space” provided moments of fantasy and escape, but lacked the feel of what it was like and we all knew it. Even Stanley Kubrick’s masterful work 2001: A Space Odyssey which was far ahead of it’s time took a leap that was just too far ahead and made it too futuristic and thus not a portrayal that late sixties Americans could relate to, but even in 1968 when the movie came out and we had yet to land a man on the moon we believed that it was a vision of where we would be. 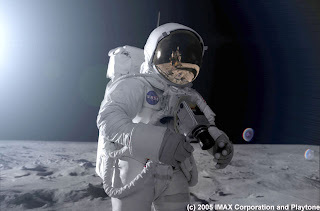 With the pervasiveness of technology into everyone’s lives today across all age groups and with powerful computers and astonishing computer graphics that one-up reality and seem so realistic that we can’t distinguish the difference between real and animated so it should be no surprise that the actual footage of humans setting foot once again on the moon will surely be a disappointment. The lives of modern day Americans has come to be so dominated by our technology wizardry that landing on the Moon seems like something we should have been doing or something we should be able to do with ease and when it happens again we’d want it to be as good or better than the IMAX. I remember hearing Buzz Aldrin’s comments after Apollo 13 (the movie) had been released. He asked where the additional footage of the launch had come from as he had not seen it before. The reason was that the footage was not real, but computer generated. So good was it that it had caught an expert by surprise. In a flip from sixties America we’ve become so enamored with capabilities of our technology that it is reality that doesn’t impress us anymore and hand-in-hand is another “side-effect” of technology in that it has made us impatient. We want the “Headline News” or “SportsCenter” approach. Show the pertinent highlights, leave out everything else and move on to the next topic. We expect information on demand and we want it in short doses. We want to see people land and walk on the Moon from every angle, but aside from liftoff and landing all the days’ in-between, the real journey would be of little interest. That was all too apparent post Apollo 11 as each subsequent mission received less and less air time. It will be a tough sell to Americans to expand our manned space program to venture back to the Moon and Mars, but space exploration is an area where international cooperation transcends politics. As countries like China and India now see the space program brings worldwide recognition and prestige and showcases what a country can with its intellect, talent and resources much like it did for the United States and Russia. America is still the premier space program, but others aspire to great things with their programs. We need not fear competition, but we also need not cede our technical leadership only because the chase no longer thrills us. The history of the human race has shown that we are explorers and our quest to reach out beyond our shores has led us to new challenges and forced us to be innovative to continue our growth and expansion. We can’t become complacent or bored with exploration because we can relive it through a film or video game. To continue to grow as a civilization we must continue to challenge ourselves and continue to venture beyond our shores and explore. If you get the chance to see Magnificent Desolation at an IMAX or at the Kennedy Space Center I highly recommend it. You’ll enjoy the experience, but when you leave the theater don’t be satisfied that it is a substitute for what we can do, but only a preview of what we will do.